In cases of severe pneumonia in children, oxygen treatment has been shown to improve survival by 35 percent and is also an important treatment for many illnesses in adults. Minister for Health and stakeholders at the Savusavu hospital. Cure Kids Fiji and the Australian Government have partnered with the Ministry of Health and Medical Services (MHMS) to take a step forward in improving health services in Fiji by providing dependable supply of oxygen to patients at Savusavu Sub-divisional hospital. Five state of the art oxygen concentrator units have been installed at the 56-bed Savusavu hospital which will help address severe pneumonia and newborn illnesses, which are still amongst the leading causes of ill-health and death amongst infants and toddlers in Fiji. The Cure Kids Fiji’s Oxygen Project team is led by Dr Stephen Howie from University of Auckland and Dr Eric Rafai of MHMS. This team supervised the installation of the equipment and training for hospital staff. Cure Kids Fiji also provided 50 percent of the funding for this project, made possible through the generous support of donors including ANZ Bank, AccorHotels, Armacup and the Rotary Club of Fiji. 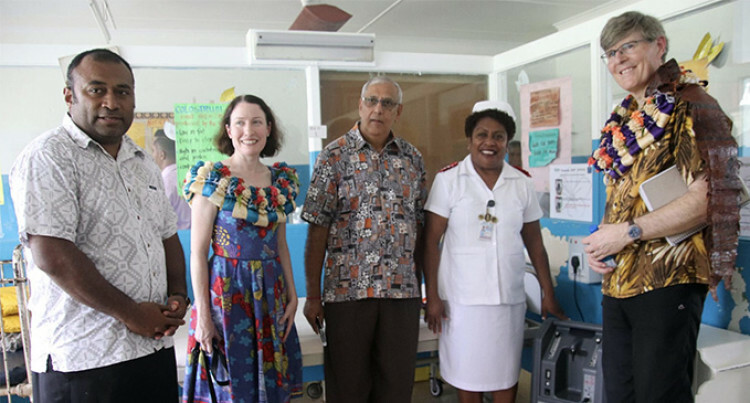 Dr Stephen Howie joined Australia’s Deputy High Commissioner to Fiji, Anna Dorney, at the Savusavu Sub-divisional hospital on Monday 08 th April 2019 to officially hand over the newly installed oxygen concentrators to the Minister of Health and Medical Services, Dr Ifereimi Waqainabete. The Minister for Health and Medical Services, Dr Ifereimi Waqainabete, expressed his gratitude to the Australian Government and Cure Kids for a well thought initiative to enhance health services at Savusavu hospital. “I thank the Australian Government and Cure Kids for the splendid achievement in ensuring the consistent flow of oxygen at the health facility which will benefit all Fijians of Savusavu and Cakaudrove,” he said. Savusavu Sub-divisional Hospital now has a dependable supply of oxygen which ensures that those needing oxygen, get it.